We received our medical results today and I wasn't happy. These results were from the Medical Diagnostics team that came to our place last week to conduct Urinalysis, Blood Chemistry and ECG. After a week, the results were handed out today at the Senior Citizens' Hall. Most of the availees were senior citizens. I still have 5 years to go before becoming a senior citizen (60 yrs old). There was a doctor available for consultation and the consultation fee was already covered in the diagnostics package price. 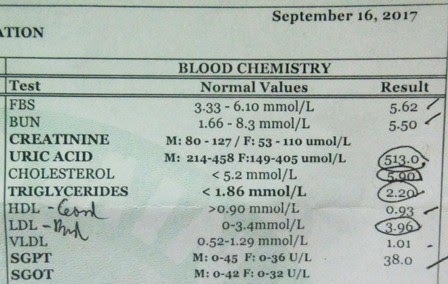 Here's a shot of my numbers for Blood Chemistry component of the medical exam. The results of the urinalysis and ecg came out normal. The consulting physician was kind enough to encircle (highlight) those test results that were not normal. This is the first time that I exceeded the normal range for Uric Acid. In the past, I kidded DH about her having elevated uric acid. Well, look who's talking now. For the elevated Uric Acid, the physician didn't advise prescription drugs. Instead, she just told me to avoid legumes (beans, peanuts, etc. ), too much organ meats and canned processed food. She also suggested drinking more water to help the kidneys flush out toxins. But here's an amazing thing. She also advised taking Turmeric Powder everyday. 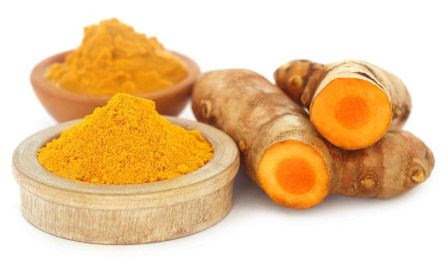 That doctor was the first ever doctor I consulted with who actually recommended a medicinal herb (turmeric) to help heal a certain ailment - in this case high uric acid. In the past, doctors would automatically advise prescription drugs and/or avoidance of certain foods. Two months of Atorvastatin - that's the prescription for the high cholesterol numbers. Ugh, statins again. Yup, it's Lipitor, that popular brand for Atorvastatin which is the highest selling drug in all of medical history. The brand that DH and I bought in the past was Xantor, 20 mg, by Sandoz. In my prior blood chem prior to this, I also had an elevated cholesterol reading. It was the first time the number went beyond the upper limit. For that, the consulting physician prescribed Atorvastatin for one month. This checkup was suppose to be a follow-up exam for that one-month treatment. Obviously, the numbers didn't improve at all. And I mentioned that to the consulting physician now, hoping she could recommend another medicine or even another mode of treatment. There have been several news reports, mostly from social media, about the dangers of statins. And this is why I'm wary of statin drugs. There are just so many that they're difficult not to ignore especially if the most glaring side effect, supposedly, is diabetes. Diabetes, is an illness that, I have to admit, I am scared of. With too many horror stories of friends getting dialysis treatments from diabetes complications, the thought of it is a bit frightening for me. For the next medical exam, I'm now thinking of adding SGOT as well as Creatinine (kidney health indicators). I've not had these tests made for a very long time, always assuming that my kidney is in the pink of health. The last time I had these were in my younger years at work. Of course they were always normal then. But now, I'll never really know until I get these tests. I'm getting old, so my old assumptions may now be wrong.